Brookstone HDMI Pocket Projector (890574) with hdmi . Shipped with USPS Priority Mail. Excellent condition. Comes with a hdmi cable. No charger. LG Projector. 2865 North Berkeley Lake Rd, Suite 10. Duluth, GA 30096. 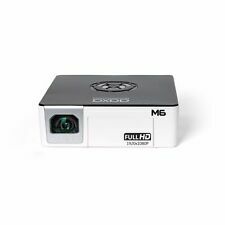 This InFocus projector is fully functional and in excellent working condition. There is minor wear on the body from normal use, as shown in pictures. It does not affect the functional integrity of the projector whatsoever. Only what is on the picture, no cords or anything else. 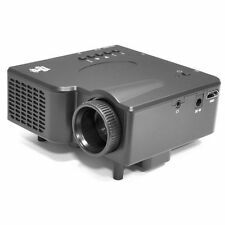 Panasonic PT-AE1000U 1080P Home Theater Projector With Remote. Tested in great condition, small crack on corner top of plastic cover makes outside cover loose but does not prevent projector from functioning properly. Trending at $293.33eBay determines this price through a machine learned model of the product's sale prices within the last 90 days. THE HOLLYWOOD STANDARD – Advanced DLP Optical Engine Boasts Superior LED Brightness, Exceptional Color Accuracy and Pristine 1080p HD Picture Quality (Best Performance when used in Dark to Dim-Lit Room). 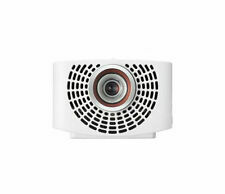 You are purchasing a Dell 3200MP Projector. This has been tested and working. good used condition. Light wear from normal use. This has 32 hours on the lamp. Includes bag and vga Cables. Does not include remote. There is noticeable wear on the body from normal use, as shown in pictures. It does not affect the functional integrity of the projector whatsoever. Reduce Reuse Recycle. 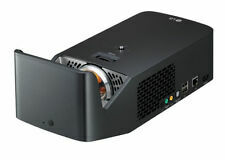 ViewSonic PJ350 Video Projector. Tested. In very good condition. Please study pics and ask any questions before bidding. Thanks! Model: SL2U. This projector is used and is in good working order. The power cable and lamp are included, but the remaining life/hours of use are not known. Manufacturer: Mitsubishi. Test Results: Tested for key functions. This projector powered on and the composite connections were tested and are in good working order. All warranties on new products are covered by the original manufacturer's policies. This includes PRAM or BIOS batteries on computers, laptop batteries, phone batteries, or any other type of battery. It has White spray paint appearance, streamline design, simple and elegant. Multi-interface design, with VGA, HDMI, USB, headphones and AV and other interfaces, built-in SD card reader unit, DVD, VCD and TV set-top box，Supports USB charging.SPECIFICATION：. Gold, Diamonds, Firearms, Coins. Things I Buy. The compact size and lightweight body give you the ability to create a large screen display up to 130 in. on any flat surface or wall. Set it up anywhere. Connectivity interface includes HDMI, A/V and RGB connector jacks. Featuring DLP DDR technology it projects bright, high-contrast color images with high color fidelity. Compatible with composite video and S-Video capability, it supports a full range of TV and video standards including NTSC, PAL, SECAM and HDTV. Had been used but is in great condition! 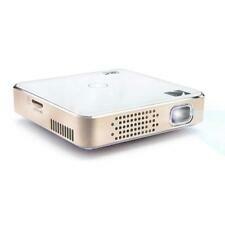 Incredible projector-moving so must downsize-cheaper and a better picture than flatscreens! It's better than arthouse theatres. I am the original owner, and this projector has never been out of the house. It is in "As New" condition. It is still in service and is in perfect working condition. The Lens Shift function provides a greater installation flexibility. Used Toshiba TLP670 LCD Data Projector. Tried it and it worked. Hitachi LCD Projector. CP-X325W With case and cords. Auctiva's FREE Counter. All Button On Top Of Projector Work. Epson MovieMate 30s LCD Projector Manuals and a subwoofer. Epson MovieMate 30s LCD Projector Manuals and a subwoofer. No control is in very good condition and works excellent. 3.5 out of 5 stars - Epson MovieMate 30s LCD Projector Manuals and a subwoofer. 3 product ratings3 product ratings - Epson MovieMate 30s LCD Projector Manuals and a subwoofer. Trending at $439.49eBay determines this price through a machine learned model of the product's sale prices within the last 90 days. Notes: Every projector furnished by TeKswamp is cleared of dust and dirt to the very best of our ability. All working components are thoroughly tested for optimal performance and parts are replaced if needed. HD Video Mode: 1080i. Toshiba TLP-S10D LCD Projector. Lamp and filter have been cleaned to improve image quality and to extend projector's life. Projector Weight: 4.6 lb. "Professionally-Refurbished Projector in Perfect Working Condition. Proxima DP2000x PRO LCD Projector.